File- Facebook CEO Mark Zuckerberg. Facebook CEO Mark Zuckerberg will testify before a congressional committee about the privacy scandal that has rocked the social media company. The House and Energy and Commerce Committee announced Wednesday Zuckerberg will testify on April 11 about the British consulting firm Cambridge Analytica, which obtained data on tens of millions of Facebook users that could be used to influence voters in U.S. elections. The firm was hired by U.S. President Donald Trump's 2016 presidential campaign, which paid the firm nearly $6 million. 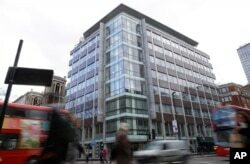 FILE - A general view of the building at 55 New Oxford Street that contains offices of Cambridge Analytica in London, March 23, 2018. Committee chairman Greg Walden and ranking Democrat Frank Pallone said the hearing hopes to "shed light on critical consumer data privacy issues and help all Americans better understand what happens to their personal information online." The panel is the first of three congressional committees that have asked Zuckerberg to testify. Zuckerberg's upcoming testimony comes after senior Facebook officials failed to answer questions during a private meeting with congressional staffers about how the company and third-party software developers use and protect consumer data. The social media giant has a large lobbying operation to advance its interests in Washington. Documents filed with the House and Senate shows Facebook spent more than $17 million in2017, much of it on an in-house lobbying team that is comprised of former Republican and Democratic political aides. The company lobbied on a variety of issues, including potential changes to government surveillance programs and on corporate tax issues.